Summary: This walk was an improvisation designed while on the walk itself. 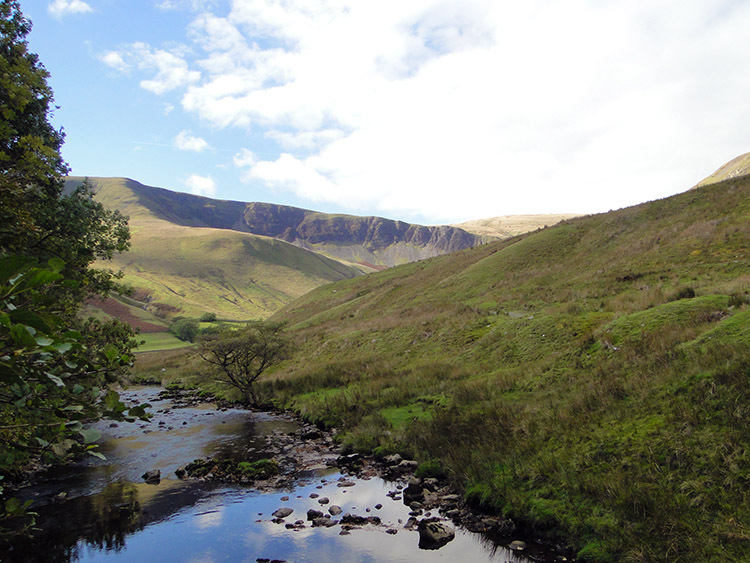 Jez had cast the seed by suggesting a walk he had found in an old Trail magazine, a walk from Rawthey Bridge to the summit of West Baugh Fell via following the Rawthey upstream to its source via Udale. However, on the day we travelled over to do the walk he forgot to bring the route description and more importantly forget the return route described in the feature. Thus I was entrusted by Jez and Dave to fashion an alternative walk. 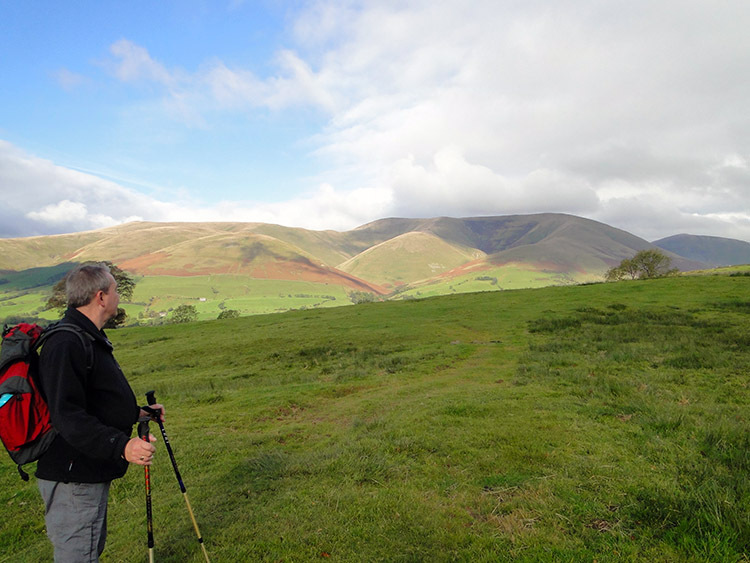 This I did by choosing to take a scenic walk into Rawtheydale from Garsdale which would allow us to follow the river upstream to Low Haygarth whilst enjoying the magnificent sight of the Howgill Fells to the east and West Baugh Fell to the west. 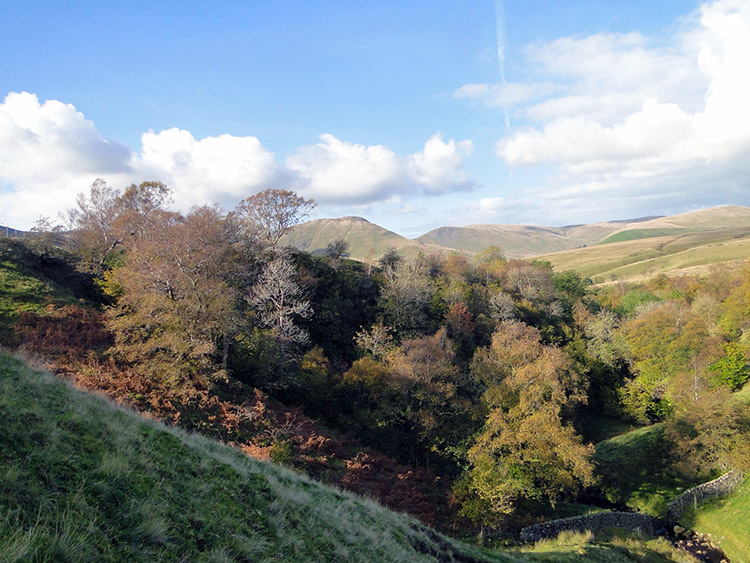 From Low Haygarth we could either ascend West Baugh Fell or improvise a return on the lower flanks of the mountain. 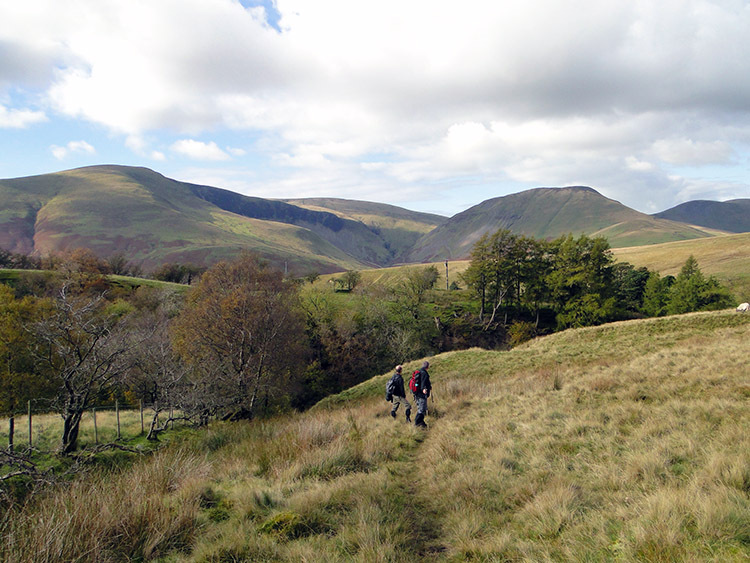 We settled for a return on the west flank of West Baugh Fell. In all the walk was a tremendous adventure on paths, bridleways and some roadside. 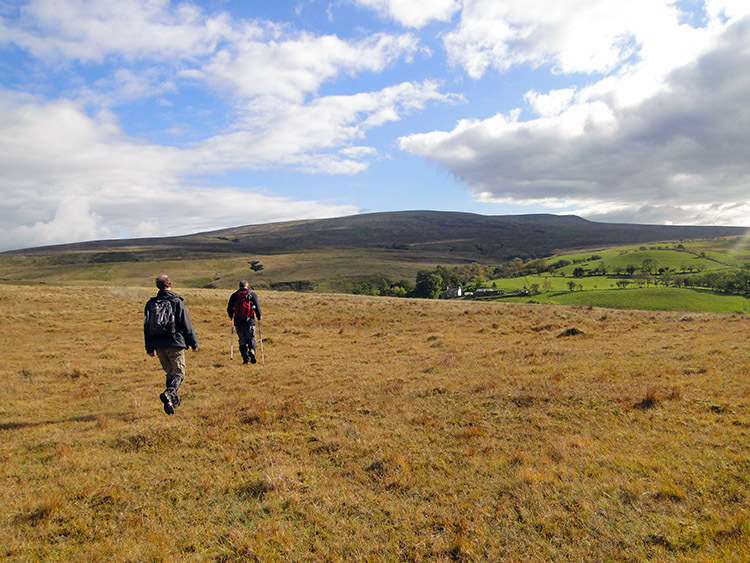 Some of the sections of the walk had seldom been tramped on which was a shame for the route was very interesting, full of diversity, extremely exciting, a navigational challenge and altogether a joy - to sum it up, it was a real treat of a walk. The Walk: Dave and Jez turned up at my house early. It was mid October, nights were shortening and we had over 50 miles to travel to the start of the walk. The original idea was to drive to Rawthey Bridge between Sedbergh and Kirkby Stephen before making an ascent of West Baugh Fell but not long into the drive over Jez admitted he had forgotten to bring the route description from a 2001 Trail Magazine with him. Not sure of the detail he asked me to check the map and see if we could work out the way. As he drove and talked with me and Dave on all kinds of subjects I worked out a plan which found favour with all, to negotiate over paths, tracks, bridleways and a short section of road from Garsdale to Low Haygarth. Then we could decide on further action. Another consideration was the need to get Jez back to participate in the 'Borough Bailiff Conker Championships' in Knaresborough. We couldn't have him missing that! One reason for setting off from Garsdale was so we did not have to drive into Sedbergh and along the A683 to Rawthey Bridge which saved us 10 miles of driving. Unfortunately I chose our starting point off a minor road which meant I had to open and close three stock gates before we even got to park the car up. On our arrival at the starting point of the walk I noted we were at the end of the lane near a return to the main road - I need not have taken the road with the gates at all! Not a very good start then, no need to dwell on it, let's go for the walk. The start of the walk needed precise navigation for there were a number of tracks going off from Clough River Bridge. One had a sign showing the 'Sedgwick Trail' which was not our intended course. We crossed over the bridge to the north side and followed a marked track up through a copse and then across a field to High Fawes. From the small farmhouse we then followed over more fields to Dovecote Gill, the first of a number of interesting gills in the early part of the walk. 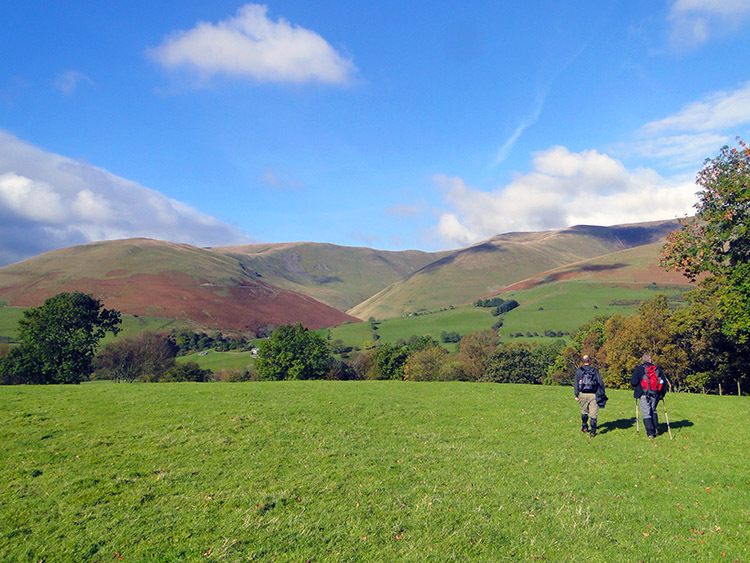 Already on the higher ground we were becoming exposed to enticing views of the Howgill Fells. They are a series of remarkable hills which always draw me to them, this time just to view from a distance but on other occasions on foot amidst them. We soon passed more farmsteads at Wilkinstile and Fellgate before heading to another called Sarthwaite. 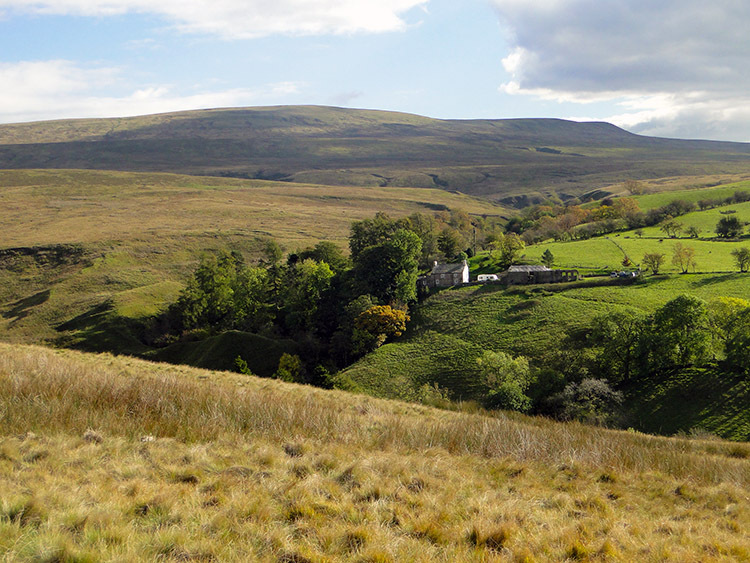 This one was derelict, a shame as it stood in a perfect place with rolling pasture around and the best views of the Howgill range to the west. Surely it will not be derelict long, a developer should be in like a shot. The walking over the pasture fields, tracks and bridleways from one farmstead to the next was wonderful with the brilliant sunlight of the Autumn day helping to exemplify the startling turning rusty colours of the trees. Grass was still a rich green despite the dying sun of summer past and the hills were as always, the Howgill Fells a mix of green, brown and grey while West Baugh Fell behind us was entirely different, a complete carpet of straw colour, all the grasses on it in their autumn coat. We descended from Sarthwaite to Hebblethwaite Gill and then across a small hill to Cross Hall, home to a caravan site which we walked though to follow the roadside of the A683 for exactly a kilometer before walking down a track to cross over the River Rawthey at Crook Holme. 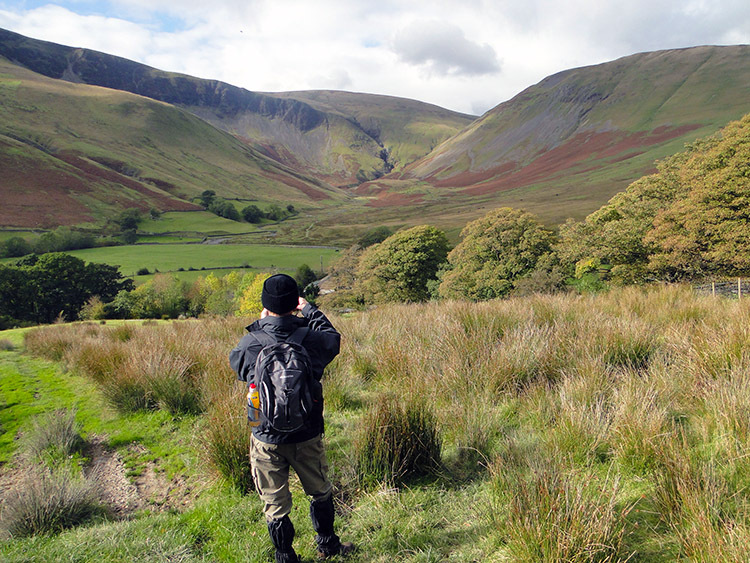 We then spent the next two hours in close company with the river on the eastern edge of the Howgill Fells on our left hand side as we enjoyed walking in scenic wonder. We crossed the river twice via footbridges and the crossed Cautley Holme Beck to arrive at Low Haygarth. Two and a half hours had passed since we had set off, it seemed much less, so I took Jez and Dave to the Cross Keys Temperance Inn, without alcohol which we had no desire for anyway. Between us we enjoyed Tea, Coffee, Ginger Beer and Nettle Wine. 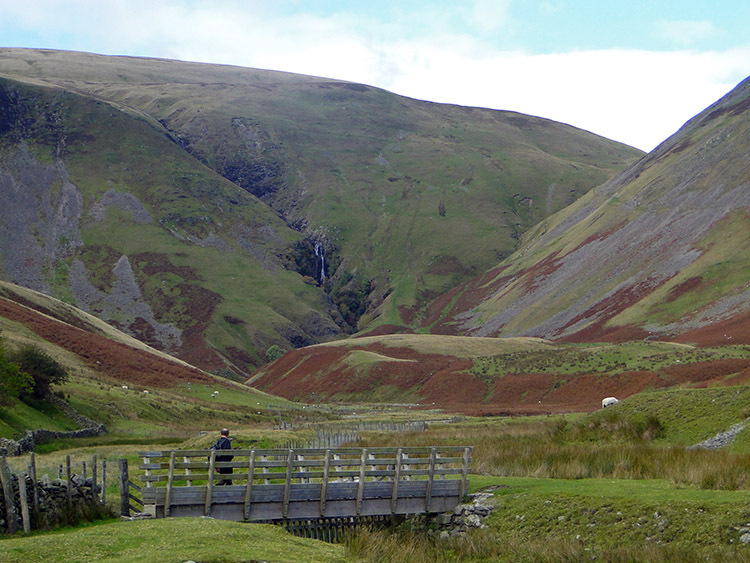 As we supped we also drank in the view of Cautley Spout, a favourite place of all three of us. While we took refreshments at the Cross Keys Jez had chosen the return route. An ascent of West Baugh Fell was not on now, it would be a long day and dark long before the finish should we attempt it so instead he fashioned a contour of West Baugh Fell at around 300m. We started out on the return journey by following the A683 for about 200 metres before climbing to the fell side via High House and Bluecaster Side. Now the adventure of mid height navigation without clear paths began. First Dave and Jez chose the traverse round Fairy Gill to Taythes. I was drawn to Taythes directly in a bee-line. Taythes House was in the most exquisite setting, practically perfect. When Dave and Jez finished their traverse and met up with me they agreed. They also agreed my bee-line was the right idea. We then tracked past the house and above the south side of the gill until the cut lessened at which point we descended to water level to cross over. Here we consented and agreed it was the place for lunch. Now we were in for a treat Dave had been promising for a while as he treated Jez and I to a gourmet feast of Vine Leaves stuffed with Rice. Resolutely Jez and I took our medicine. The aftertaste was less harsh than the initial hit. I don't think the delicacy will enter our regular diets though! After our OK food experience we resumed our adventure over West Baugh Fell terrain which was simply brilliant, a walk as good as most popular routes and one better than a lot. The views were worth it alone, we all agreed we were taking in some striking panoramas. We continued on level sections in full flow and then down and up a couple of pesky gills which came on us at the last moment. 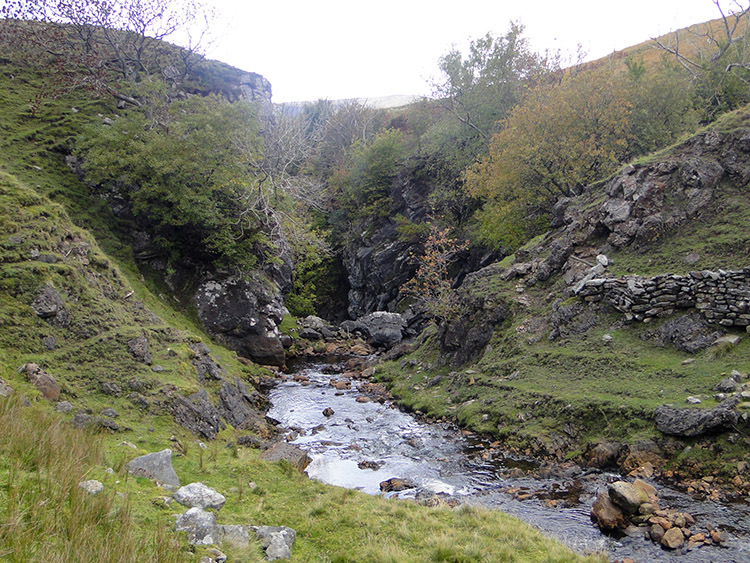 These were Whinny Gill and Nor Gill, both reminding us we were on a proper walk and not a jolly day out. We then reached another but we knew this one, having crossed it downstream earlier in the walk. This last sudden descent and ascent was to cross Hebblethwaite Gill. We had done so about 5 hours earlier about 750 metres downstream. The crossing of Hebblethwaite Gill for the second time heralded our departure from the fell. A few hundred metres further on we came to the farmstead at fell side again and then we followed our course back from which we had originally set out. Highlight of this final section were the lovely views to the drumlin hills of the Frostrow and Middleton Fells, surely a place for future exploration. For now our final experience was to find a Soul Barn at High Fawes, a night clubbing spot for the locals many will not know about. I bet many a good party has been had at High Fawes. Our good time party had been the walk, an unplanned improvisation which turned out to be a wonderful adventure. I can't wait to do something similar again soon. I am sure Jez and Dave will be up for it.